It's sooooooo easy to shop for our girlfriends, moms, sisters, aunts...any woman in our lives. When it comes to the boys, well that gets a little tricky. They typically aren't into clothes, shoes and accessories (at least my husband, dad and brother aren't), don't wear make up or paint their nails. Also, it seems as though Christmas gifts for men are more expensive. If you are looking for a few unique gift ideas for the men in your life, I think I may a have a found a few for you. You won't see a tie, cologne, cuff links or any clothing in this round up. Everything selected is something that my husband has (and loves) or ideas that he gave me. The two items I MUST mention are the Yeti Rambler and T-Fal. We have both. The Yeti cup is a dream come true. This is great for both men and women. It keeps coffee hot for HOURS and iced drinks cold for days. I SWEAR. It is a little expensive for a cup, but worth every single penny. Promise. The T-Fal is a chicken wing lover's BFF. It's perfect for game day or any other day. You can also cook vegetables and other foods...pretty much anything you can think of. It is a low-fat cooker and super easy to clean. Several of our friends went out and bought one after they saw us use it at a football party. I really do hope this guide gave you a few new ideas for the guys. I know it's so hard buying for them and it's so much more fun to wrap up something other than a gift card, shirts, ties, socks, boxers or shaving kits. If you have any other cool ideas, something that your husband or dad loved, let me know in the comments. I need all the help I can get. I am sure plenty of us do. Great Ideas! I love the beer caddy, that is really cute. these are so awesome! michael and I have a inside joke about yeti so i might need to get him the rambler! Hank would love the personalized craft beer holder- awesome idea! Love these great gift ideas for men! Thanks for sharing! I think I need one of those Yeti mugs for myself!!! 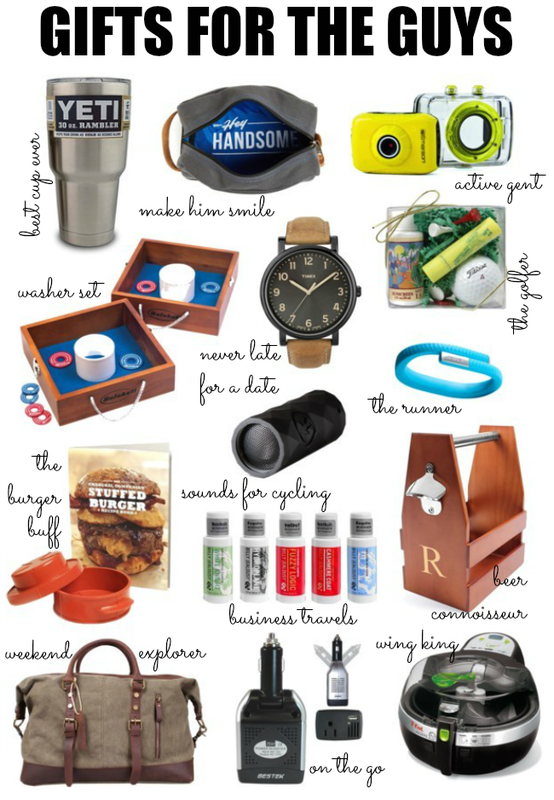 Love this round up - guys are seriously impossible to shop for! Thank you so much for this great gift guide! I always struggle to find the perfect gift for the men in my life, so this will be really helpful! Great ideas! Tyler is considering doing that craft beer holder for his groomsmen gift! I went a little outside the box this year for my husband. He has 6 watches that he rotates so I purchased him a nice watch box - protects the watches and looks better than just laying on his dresser. I also got him a remote control helicopter - hopefully will remind him that life can still be fun in your 40's. :) The most meaningful gift I purchased was a large photo of him and our fur baby right before we let him go - it's a very poignant photo and I know my hubby will love it. Completely with you - shopping for boys is a tough gig. Thanks for the ideas! What amazing ideas!! I love all of these picks girlie.